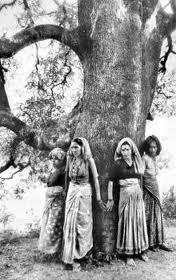 Nearly 280 years ago, the sacrifice of a brave woman, Amrita Devi, would have ripple effects in one of India’s most vibrant environmental movements called the Chipko Andolan in the 1970s. Amrita Devi belonged to the Bishnoi community that is known for its great love for conservation. The Bishnoi faith respects the sanctity and sacredness of all forms of life and their tenets include prohibition on killing animals and felling of green trees. Bishnois also worship the Khejri tree, Prosopis cineraria, considered a critical life force in these desert communities. As the story goes, the King of Jodhpur sent his soldiers to the Bishnois villages to cut green trees to build his new palace. As the soldiers began cutting the Khejri trees with their axes, Amrita Devi, a Bishnoi woman, ran to stop the felling. She hugged a Khejri tree to protect it from the blows and begged them to stop. 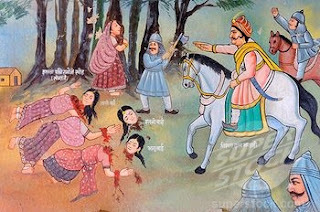 The soldiers asked her for a bribe to stop the cutting; Amrita Devi was unmoved and told them that it was an insult to her faith to offer a bribe. The soldiers took to violence and struck her with an axe. When her three daughters witnessed the brutality, they rushed and hugged the trees as well and were also killed by the soldiers. Soon the word spread like fire around the village of Khejarli and others joined in, hugging trees in a nonviolent protest. The soldiers continued to mercilessly kill people, both young and old, and the massacre led to the sacrifice of nearly 363 Bishnois, who died protecting their beloved sacred tree. When the king learned about the carnage, he was repentant and forbade any killing of animals and cutting of trees in the Bishnois territories. Even to this day, one can spot the endangered Black Buck, peacocks and other wild life and tree cover where the Bishnois communities live in Rajasthan. It is no wonder that the Bishnois are considered as among the earliest conservationists in the world. 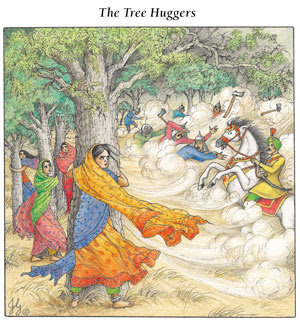 The Chipko Movement is a great example of a Gandhian movement that was based on nonviolent principles of satyagraha. Chipko means to hug, and this movement is synonymous with the enduring images of rural women hugging their community trees to stop rampant deforestation. In the Garhwal Himalayan region of Uttarakhand in the 70s, there was rapid environmental degradation due to commercial logging. It became clear, especially to women, that logging was destroying their forests and threatening their access to key forest resources needed for their daily sustenance. Archival photo of the Chipko Movement, where women battled guns and threats to protect their forests. Soon villagers began organizing themselves in small groups to organize against logging. A pioneering Gandhian grassroots activist, Chandi Prasad Bhatt, mobilized communities to stop the destruction of the forests. He was joined by hundreds of women, who were on the front lines of the resistance—marching and rallying to protect their community forests and formed human chains to hug towering old growth trees. This kind of environmentalism was inherently linked to their survival; the women recognized that their livelihoods and wellbeing were intertwined with ecological protection. “This movement of the poor women was not a conservation movement per se, but a movement to demand the rights of local communities over their local resources. The women wanted the first right over the trees, which they said were the basis for their daily survival. Their movement explained to the people of India, that not poverty, but extractive and exploitative economies were the biggest polluter,” writes Sunita Narain, director of Center for Science and Environmental in New Delhi. The impact of the Chipko movement had spread far and wide beyond the state of Uttarakhand and led to the government issuing a ban on felling of trees for 15 years until the green cover depleted by deforestation was restored. And the legacy of tree hugging continues to this day, as do the challenges for people's access to community forests and threats from ongoing forest degradation. “Forest is Our Mother. Our life sustains on her. A few months ago, I had the privilege of meeting a group of adivasi (indigenous) women in the state of Jharkhand, who are mobilizing their communities to protect their forests, as well as educating others on their rights over natural resources. Jharkhand, meaning the land of forests, has seen some of the most vibrant people’s movements to protect forests and lands from mining and other extractive activities. An adivasi woman, Suryamani Bhagat, has been on the forefront of the Jungle Bachao Andolan, Save the Forest Movement, in her state. During a conversation with Suryamani and other adivasi women from the movement, I learned how they are deeply connected to the forest. “Forest is our Mother. Our life sustains on her and our spirituality is tied to the trees,” said Suman Munda, a young tribal woman and forest activist. Over the past many years, adivasi women and men have joined hands to reclaim their rights over their community forests; the have created forest watch committees to ensure there is no illegal cutting of the trees, and they are raising awareness on the Forest Rights Act passed in 2006 to enable forest dwelling communities to access resources that have been denied to them as a result of the continuation of oppressive colonial forest laws. “At first there were many injustices against adivasis. People used to think forests belonged to the forest department and some adivasis were jailed and beaten for using the forest produce. We realized that we needed to organize and assert our rights and protect our jungles,” she says. Suryamani also shared that the forest department would promote monoculture plantations of Eucalyptus and Acacia varieties in their rich, diverse jungles that had little to no value for adivasis, who relied on indigenous trees like Sal, Mahua and Amla for their foods, medicines and rituals. In India, mining, hydroelectric and nuclear power projects, industries, among others, are displacing thousands of farmers, fisher folks, pastoralists, artisans and indigenous people from their homelands. Historian, Ramachandra Guha notes how the environmental movement in India arose out of the imperative of human survival. “This was environmentalism of the poor,” he wrote. This “empty-belly environmentalism,” where women and girls in India, undoubtedly the poorest, who are most acutely affected by hunger because of the multi-faceted discrimination they face, find themselves on the frontlines of many people’s movements against land and other resource grabs, not out of choice but from the sheer will to protect their livelihoods and dignity, their identity and culture. From the brave sacrifice of one Bishnoi woman to the long movement building of women of the Chipko Movement to the ongoing struggles of adivasi women in the Save the Forest Movement in Jharkhand—they all exemplify why it is crucial for women to have equal access and control over natural resources. Environmental movements globally can learn from these bold uprisings of women and make greater commitments to build more diverse and inclusive movements to ensure that indigenous women and women of color are active participants in these struggles and are able to share their vital experiences and perspectives on environmental protection. As I was said goodbye to Suryamani in her village in Jharkhand, I asked her what changes she had noticed in the forests since the Save the Jungle Movement began. “Our forests are regenerating, she said. "The birds and animals are returning, and we also spotted a leopard." I also wondered what the mainstream urban community could learn from the mobilizations of adivasi communities in Jharkhand. “Our life is bound with Nature. You can learn from that,” she said. Rose Wamalwa is GWWI Kenya/Tanzania Regional Coordinator. She was selected as 1 of 4 East African women for the inaugural GWWI Fellowship class in 2011. 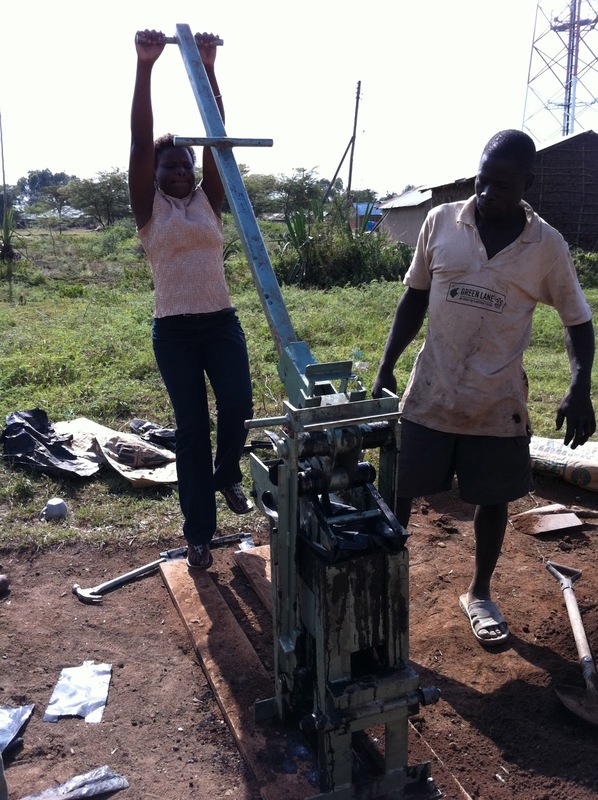 Because of her stellar work, she was hired as by GWWI to manage and support 5 women's teams in Kenya and Tanzania. She also opened her own organization called Women in Water and Natural Resources Conservation to become one of the first GWWI Women and Water Training chapters in East Africa. This is one of her stories. A story is told of a village by the name Kharanda. The residents of this village were privileged to have a community health dispensary that was constructed in 1996, exactly 17 years ago. It was a sigh of relief for men, women and children since they could access healthy facilities easily. However there has been a major problem of lack of safe water to run the health facility. Kharanda Community dispensary serves 20 villages spread over a radius of 5 km, for 17 years this facility has never had any source of water supply. Nurse Catherine who is currently in charge of the facility has faced a lot of challenges running the dispensary without water. They had to introduce a system where patients had to bring with them water for use in the facility. Alternatively the patients are required to pay a small fee that is used to hire people to supply water to the dispensary for cleaning the facility. Nurse Catherine admits that it has been a big challenge administering health services in the dispensary without water. This has led to re-infections especially water related illnesses such as cholera, diarrhea and typhoid. Patients have therefore not been able to access safe water for drinking and even washing hands after visiting the toilets and after changing the baby nappies. Many instances have also been reported of patients who have complications and require admission and continuous observation by health practitioners, but since the dispensary does not have access to safe water, they cannot run an in-patient unit. This has led to a number of patients succumb to related complications. Keeping the facility clean has always been a challenge since there is no water at the dispensary. In February 2013, Nurse Catherine’s story has changed, WWNRC in partnership with GWWI, constructed a 15,000 liter rain water harvesting tank that now provide quality water for the patients and the staff. Women and children no longer have to bring water to the facility nor pay a fee to carter for water supply. The dispensary’s hygiene status has improved and Nurse Catherine has alluded to staring a maternity wing to carter for expectant mothers. WWNRC is grateful for our partnership with GWWI. We are proud of what we are learning and the impact it is having in our community. Spring is a busy time of year here at Team WEA as we plan for events and shift our programs into high gear. None of this would be possible without our stellar group of interns who help us keep things running smoothly. We are so grateful that these wonderful ladies have chosen to share their time and skills with WEA. So without further ado, here they are! 1. Tell us about yourself! What is your background and what has been your journey to WEA? I'm a third year undergraduate studying Biology and Public Policy at the University of California, Berkeley. I stumbled upon WEA while browsing Idealist and once I learned about all the amazing things that the organization does on behalf of women and communities all over the world, I knew that this was the organization I had to be a part of! 2. What do you do at WEA? I’m a General Intern so my role in the office varies each day, but I generally provide support to the WEA team, especially during their fundraising events and through managing donations. 3. Share 2 unique things about you that your co-workers do not know. I'm a dual citizen as of April 2012! Though I was born in California, the majority of my family is Canadian, including my parents, so I felt it was necessary for me to also have Canadian citizenship because it was such a key part of my identity. I also have no tolerance for spicy food, but I'm trying to work on it. 4. What do you see as the biggest challenge in the intersection of women and the environment? The biggest challenge would be for societies around the world to realize that women matter. More often than not, women are often neglected by the decision-makers of society. Yet, it is important to realize that women are not only the most unnoticed but also the most important stakeholders in society. Women are the ones raising families and taking care of the household, and in order for society to flourish and be able to tackle big issues such as population size and environmental degradation, women must be empowered and their opinions must be taken seriously. 5. Tell us about a woman who inspires you and why. As cliche as this may sound, my mother inspires me the most. I'm fortunate to have such a close mother-daughter relationship with her and be able to call her my best friend. Some people hide things from their parents, but I basically tell my mom everything going on in my life. She and my dad are my rock and support, and I have learned a lot about myself by hearing stories from them. 6. Tell us one thing that surprised you about being at WEA. Everyone is so nice! I was so nervous on my first day and I did not know what to expect, but WEA is such a welcoming environment and the WEA family readily took me in with open arms. They are the best. 7. What do you hope to get out of your time at WEA? I hope to learn more about the non-profit world and how organizations function as well as more about the interconnected relationship between women and the environment, as these lessons will definitely help me in the future. 1. Tell us about yourself! What is your background and what has been your journey to WEA? I am a Senior Environmental Science major at the University of San Francisco. 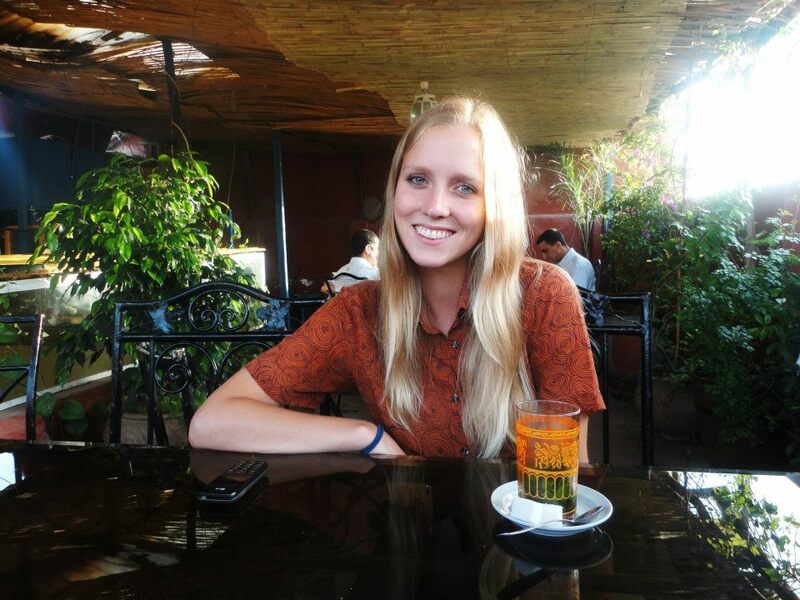 I became fascinated with the idea of women's empowerment as the route to improving quality of life through an internship I did in rural Rajasthan, India. 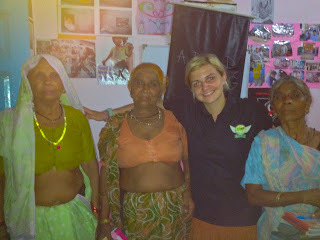 In summer of 2012, I spent ten weeks with a grassroots NGO helping them start a women's empowerment group. I learned so much about the beauty and pain of being a woman. When I found WEA, I realized it was the perfect way for me to continue learning about and contributing to groups of women similar to those with whom I had worked all summer. 2. What do you do at WEA? I am a General Intern and have only been with WEA for a very short time, so have not gotten too involved yet. Thus far I have been doing organizational tasks and helping tie up the loose ends for the End of the Year Fundraising by completing thank you cards and documenting donations. 3. Share 2 unique things about you that your co-workers do not know. I love to dance (anywhere, all the time! ), and I wish I had been able to meet and talk with Karl Marx and Erich Fromm. 4. What do you see as the biggest challenge in the intersection of women and the environment? One of the biggest challenges in the intersection of women and the environment is building the confidence in women and other community members that women have a unique intelligence and role in society that allows them to nurture people and the earth in a beautiful and effective way. Continuing to create that shift in consciousness, through organizations like WEA and its grassroots colleagues, will pave the way for women to hold power within the community that is recognized rather than overlooked. 5. Tell us about a woman who inspires you and why. A woman who inspires me is my best friend, Gina Fountain. She inspires me because she embodies a slew of feminine characteristics and not only holds them proudly, but uses them to her advantage. She is empathetic, forgiving, and exceptionally intelligent and uses these qualities in all areas of her life. She always seeks to support and protect the vulnerable, forgotten, and voiceless. She approaches everything with love AND knows how to have a good time. She is a beautiful human being. 6. Tell us one thing that surprised you about being at WEA. I'm sure I have many more surprises to come in my time with WEA, but one thing that particularly stood out to me was in reading the employee manual. There was an explicit emphasis of being 'real' in the workplace. WEA strives not only to do positive things in the world, but to accept the realities of us being flawed humans. In my time here, I'm very excited to work hard support all of the ongoing projects at WEA in any way I can, but it makes me feel more confident knowing that I'm expected to be human, not Superwoman. 7. What do you hope to get out of your time at WEA? During my time at WEA, I hope I gain a greater understanding of how non-profits like WEA function. I greatly admire WEA's emphasis on the idea that we are a network of women around the world, working as a team, not as a first-third world hierarchy. As such, I'd like to learn more about how WEA has created and maintained this network. I'm also looking forward to getting to know my co-workers as they all seem like really amazing women. 1. Tell us about yourself! What is your background and what has been your journey to WEA? My name is Torrin Marquardt and I am in my final semester of undergraduate study at UC Berkeley, with a major in Peace and Conflict Studies with a concentration in Culture and Identity, as well as a minor in French. I grew up in various countries around the world, including France, Germany, Cameroon, Madagascar, and Australia. During my time on the African continent I developed an interest in women's rights advocacy. This interest was then strengthened when I studied abroad in Morocco and interned at a women's shelter called Au Grain de Sesame. This shelter took impoverished, uneducated women from the medina streets and taught them how to create art out of recycled materials, which was then sold in the shelter’s literary cafe. I was inspired by the organization’s emphasis on training local women and environmental sustainability, and am therefore incredibly excited to be working with WEA to assist other community-based organizations driven by strong women. 3. Share 2 unique things about you that your co-workers do not know! 1. The scariest experience of my life was bungee jumping off a 134-meter (440-foot) suspended platform in the Nevis River Valley in New Zealand. 2. I've had my pants pulled down to my ankles by a Patas monkey in Cameroon. 4. What do you see as the biggest challenge in the intersection of women and the environment? I believe a major challenge is installing long-term change, rather than simply implementing immediate yet unsustainable solutions. Often aid is provided in monetary forms, which can help in the short run, but does not benefit communities for their futures. Therefore, efforts must be made through training and capacity-building. It's like that famous proverb: "Give a man a fish and you feed him for a day. Teach a man to fish and you feed him for a lifetime." 5. Tell us about a woman who inspires you and why. I know it's the most cliche answer out there, but my mother is a major inspiration for me. She was very active in supporting women's rights in our various overseas homes, and this attitude definitely rubbed off on me and is a huge part of why I'm currently interning with WEA. When I think of her work, what immediately comes to mind is the memory of her walking hand-in-hand with Cameroonian women at the front of the Women's Day Parade. She is one of the most selfless and committed individuals I know. 6. Tell us one thing that surprised you about being at WEA. I was surprised by how loving and welcoming the WEA community was, from the minute I walked in the door for my initial interview. It's refreshing to be in such a friendly and warm office setting, and I think this attitude definitely translates into how everyone at WEA communicates and interacts with the public. 7. What do you hope to get out of your time at WEA? The kind of work that WEA does is something I want to pursue in the future, so I hope to gain an overall deeper understanding of how a smaller grassroots organization functions. Women and the environment are two areas that I care deeply about, yet are often neglected, and I see WEA as a great starting point for learning how to target these issues. **Jami Fogelhut (not pictured here) was one of our amazing Fall/Winter General Interns. We'd like to thank her for all of the hard work she's done for WEA over the course of her internship! Meet the rest of the amazing interns that have worked with WEA throughout the years here!